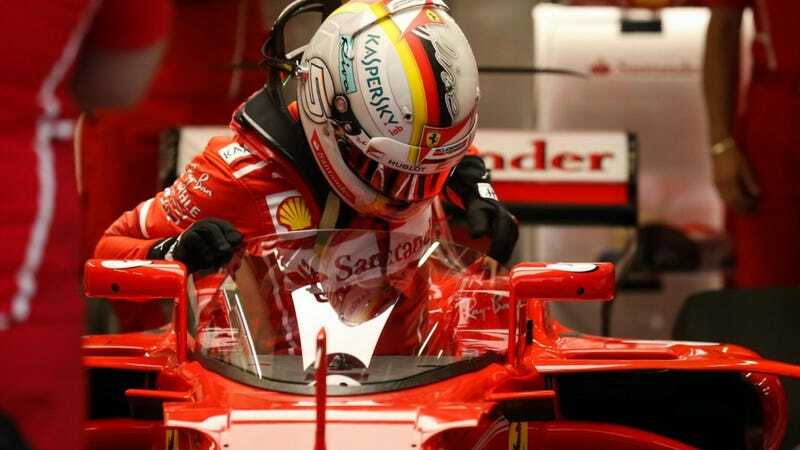 Formula One is testing their new debris-deflecting shield for the first time during practice today on Sebastian Vettel’s Ferrari, but Red Bull team principal Christian Horner is SO not on board with it. F1's answer for head protection is a wrap-around windshield that looks suspiciously like the idea Red Bull had last year. Formula One has been trying to add better protection for drivers’ heads while trying to avoid the obvious, widely-accepted answer of closing the cockpit. It’s been exactly as ridiculous as you’d expect, starting off with a near-universally hated halo idea that made F1 cars look like a giant flip flop so ugly, only Instagram #teens would ever wear it. Now F1 is pushing a windshield, which Red Bull sort of did already with their team’s aeroscreen idea. Red Bull even started testing the structural integrity and crap-deflecting abilities of the “big windshield” idea in hopes that it would gain traction with the series, but it didn’t—until now, apparently. To F1's credit, their new polycarbonate shield lacks the two upright support beams of the aeroscreen, but Red Bull still seems pretty miffed that they didn’t at least get a nod for thinking of the sleek windshield idea first. So I would rather get the job done properly for 2019 than rushing something through for 2018. We will be relying on the feedback from one driver in one set of conditions. It won’t be dark, there won’t be lights, there won’t be loads of oil on it, and those factors. I am concerned this is being rushed through without all of the due diligence being done properly. While this all sounds like a man scorned, there’s at least some shred of deja vu in Horner’s statements. Remember how the halo went? Formula One made a big push to offer better head protection for drivers in the form of adding a halo, which was an ugly compromise, but probably better than nothing. Then the FIA ultimately canned the halo after it said the idea needed to be researched further, leaving heads only protected by drivers’ helmets for the near future. Horner bringing up the shield’s lack of testing ultimately challenges everyone’s faith in F1's ability to get a safe, working solution together before the series’ self-imposed deadline of next year. Again. Mmm, that’s cold. Why not just get it over with and close the cockpit already? Bonus: Red Bull didn’t have a similar idea to that first.